In the wake of the political and social unrest that has been sweeping across the Middle East following the downfall of the Tunisian and Egyptian leaders, ratings agencies are preparing to issue more downgrades in the region. As Global Finance went to press, Fitch had downgraded Libya to BBB and Bahrain could see a downgrade if the protests there continue unabated. The agencies are concerned that the protests are heightening the risks to the region’s economies and may be encouraging governments to act in a less fiscally prudent manner as they seek to quell the unrest. Following the violence on the streets of Manama, Bahrain’s capital, in mid-February Fitch Ratings placed the country’s long-term foreign currency issuer default rating, its local currency IDR and its shortterm foreign currency IDR on negative watch. In a statement, Fitch Ratings’ Purvi Harlalka, director in Fitch’s Middle East and Africa sovereign ratings group, said the growing unrest together with the growing divide between protestors’ demands and the government’s position on political reform suggested that the protests are likely to drag on. “The unrest has created economic and political uncertainties, which increase the risks to the sovereign’s credit profile,” said Harlalka. 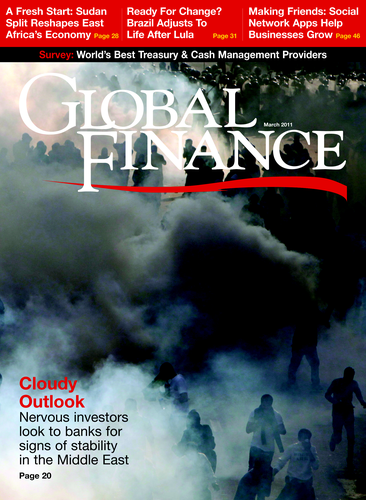 Fitch is particularly concerned about what it termed expansionary fiscal measures by the Bahrain government, with the demands of the protestors resulting in King Hamad bin Isa Al Khalifa announcing cash handouts of 1,000 dinars ($2,650) for local families, which Fitch estimates constitutes 2% of GDP. If the government continues to hand out cash, Fitch says, the risks to the economy and public and external finances will be magnified. If larger fiscal costs are incurred, Fitch indicated, it is likely to result in a downgrade for Bahrain. 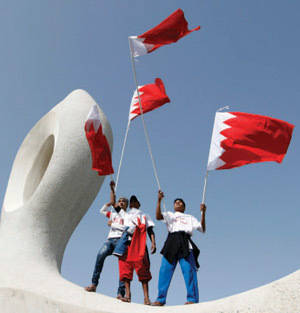 The February cash handouts to appease protestors come on top of other expansionary budget measures, which Fitch predicts will see Bahrain’s gross debt more than double to 38% of GDP by 2012 from 16% in 2008. Bahrain’s economy relies heavily on oil income, and with crude oil prices hitting a two-year high of more than $104 per barrel as a result of simmering tensions in the Middle East and North Africa, Bahrain should be able to meet its debt obligations. However, Fitch says the increase in debt is weakening the kingdom’s credit-worthiness.